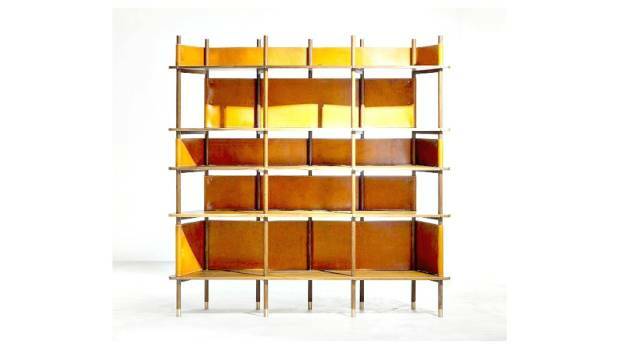 The ‘Angle’ is a modular bookshelf or partition. It won a Platinum, award in the ‘Furniture, Decorative Items and Homeware Design’ category. When is a chair not a chair? When it’s “a way of interaction with furniture”. Did you know that some coffee tables aren’t just holding up magazines, they’re “denying abstraction, and welcoming figurative visual representation”? No? Well, you’re clearly not up on your avant-garde furniture designs. 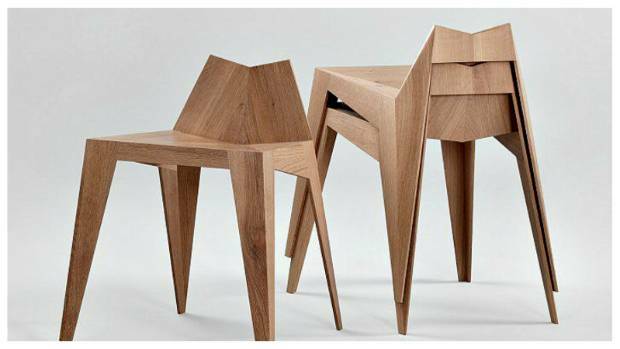 German designer Matthias Scherzinger made these ‘Stocker’ chairs from solid oak. There’s no shortage of award programmes for furniture and lighting designs. Some are sponsored by academic institutions, others by on-line design forums, but in any case, they’re all an opportunity for students and up-and-coming aesthetic boundary-pushers to get their creations out the wider world to be critiqued and lauded by those who (presumably) know what separates the truly imaginative from the downright kooky. The A’Design Award Competition is an annual juried design competition that honours design-oriented people and companies worldwide. 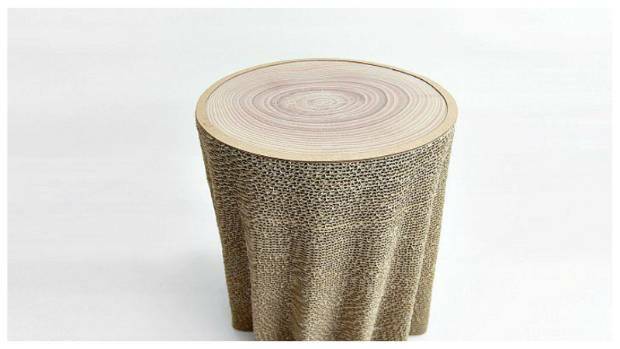 Ninety sheets of cardboard, a high-tech cutting process and hand-gluing all result in the ‘Morph’ side table. Everything from furniture design, packaging, websites and conceptual yachts are judged by an international panel of academics, architects, product designers, animators, artists and creative consultants. We’ve picked a few of the award-winning furniture designs that that caught our eye. 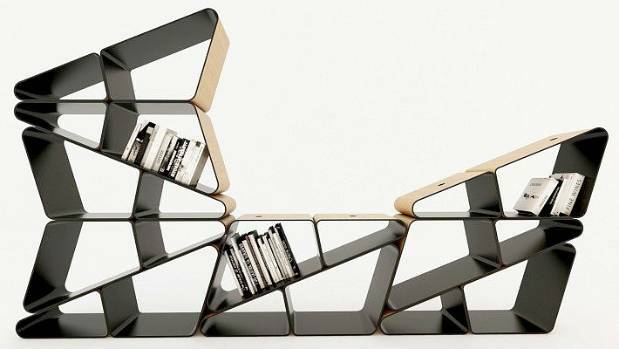 The Angle bookshelf is the creation of Turkish designer Selami Gündüzeri. The design is based around a two-part module that looks like a rounded acute triangle. 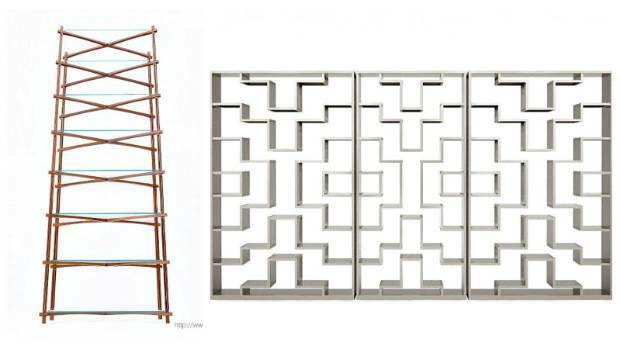 Any number of these modules can be stacked next to, and on top of, each other to create a partition or bookshelf of any size and height. 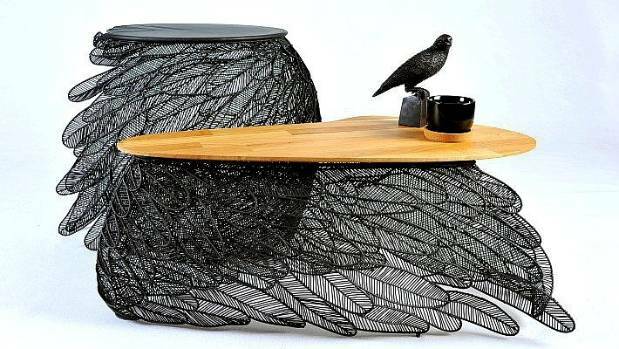 The bases of the ‘Feather’ coffee table and side table are made from individual feahers, handmade by designer Apiwat Chitapanya. The modules are made of moulded timber, and magnets set into the middle of each of the unit’s three sides enable multiple units to connect securely. “​When I first started designing Angle, the first idea in my mind was to create a form and make it as a single use, and at the same time reach an unlimited size when it is combined and increased. So it had to be infinite,” Gündüzeri says. Due to its innovative design, the Stocker Chair by Matthias Scherzinger can be pushed completely below a table, or stacked onto each other for easy storage. Scherzinger’s workshop is near the Black Forest in Germany, and he says he was inspired to create a lightweight chair out of solid oak, using traditional techniques. Based on traditional textile looms, the ‘Weave’ display shelf is made of leather and rosewood. Hi-tech meets lo-tech and cardboard becomes an intricately designed sidetable in Morph by Daisuke Nagatomo and Minnie Jan. The designers started with a digital modeling in 3D software to form the particular shape of Morph, and tested with a 3D printed model before the production. After all the cutting geometries were nested on a (computer-aided design) CAD file, it was sent to a (computer numerical control) CNC machine. Ninety sheets of uniquely shaped 5mm cardboard were produced, and each sheet was carefully glued by hand. Bookshelves are always up for a high-concept reinterpretation. Here, the ‘Nui X-hale’ (left) and the ‘Literis Lux’ (right) are from Nicaragua ans Switzerland, respectively. The bases of the Feather coffee and side tables are equally intricate, but rather than being fabricated using digital technologies, these were made by hand. The table tops are laser-cut metal or wood. You may never lose the remote again… and you’ll have a potted plant for company in the Changeable Chair, made by a Zhengzhou-based team of designers. Display units – that is, bookshelves or room partitions – are always ripe for reinterpretation, and designers tend to go either highly futuristic, or revert back to traditional motifs. An example of the latter is the Weave unit by Jo Zhu. The piece is made of South American rosewood, cattle hide and copper. Long leather pieces are woven through the rosewood frame. The Literis Lux bookshelf is at the opposite end of the spectrum. In this piece by Swiss designer Eckhard Berger, stainless steel tubes and glass panels are arranged in a highly rigorous pattern. The shelves and dividers follow a stair-shaped symmetrical design, which is emphasised when two or three units are joined together. 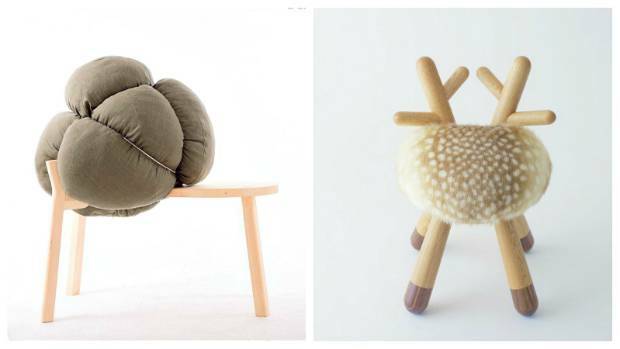 ‘Broccoli’ and ‘Bambi’ offer two very different versions of a chair. “The spacing of the shelves was chosen based on a statistical analysis of the book collection of the city library, which helped to determine height and width of the individual compartments,” says Berger. Individual compartments play a role in the Changeable Chair by ShockWave Design Studio. This customisable seat promises in convenience what it might lack in cushy-ness. Standard 30mm boards are shaped with a CNC lathe and router, then joined using traditional techniques. 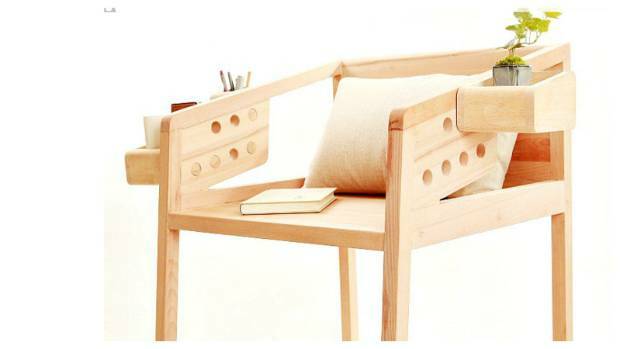 The resulting chair has a series of holes along each side. Small boxes, fitted with pegs, can be attacheds to the sides of the chair and used as storage compartments. The austere form of the ‘Pudica’ chair was inspired by the Jesuit monks that colonised Brazil in the 17th century. Chairs are often found in fantastical shapes in these design competitions, and the Broccoli and Bambi are no exception. Broccoli, by Chinese designer Jie Luo, takes a base frame that somewhat resembles an overgrown bike seat, and adds a free-form beanbag sort of element as the back. The ‘Chieut’ table is a literal interpretation of a Korean logogram. “After I asked myself a simple question about form: what if chair’s back is not plane but object? I began to think about the necessity of the question, and then it hits me that the answer to it may have much more potential than it seems to influence user activity, ” says Jie. “The Broccoli has no front or back, left or right, it expands the way of interaction between user and chair from two dimensions to three dimensions, and offers much more possibilities of action, and encourages people to use it variously,” Jie continued. In other words, if you’re just looking for a place to sit and veg, you’ve come to the wrong place. Broccoli is a “way of interaction with furniture”. Bambi, on the other hand, is just plain adorable. This child’s chair by Japanese designer Takeshi Sawada has a soft faux-fur seat, and rounded wooden ‘antlers’. It’s more than just cute, says Takeshi. Bambi might make children behave better. 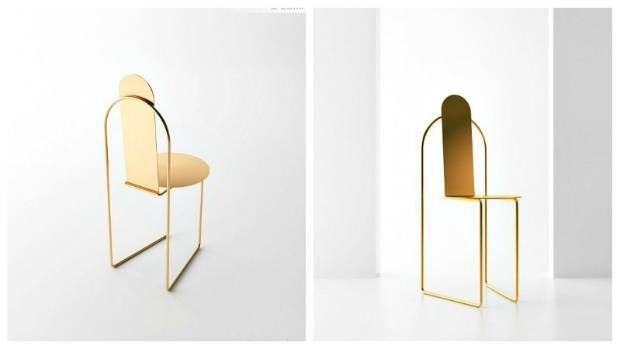 More graceful than adorable, the Pudica chair is a more like a sinuous sculpture by Brazilian designer Pedro Paulo Venzon. The chair is made of polished steel, and its name means “modest”. The Chieut table by Jay Design is equally austere. It is literally a pictorial translation of the Korean logogram into a sophisticated steel table. 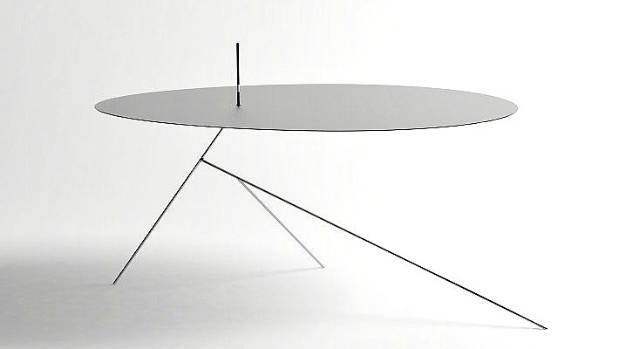 It uses three thin, widely splayed legs to keep the heavier steel tabletop balanced. The designer says the table “highlights another possible facet of minimalism: denying abstraction, and welcoming figurative visual representation”. Nicaraguan designer Jaime Rosales moved away form traditional woodworking techniques with the Nui X-hale bookshelf. The flat-pack unit of ipe timber shelves is assembled using a system of polymer-based and metal-alloy connectors. Could Rosales be heralding the end of Ikea’s ubiquitous hex-key? Watch this space.